While cleaning out some of my great grandfather's old belongings I came across this ring and wanted to see if anyone could give some information on it. It was with his Masonic Bible issued to him in 1942 at Occidental Lodge 22 in San Mateo, CA. by Master: R.L. Peters. I won't waste your time asking what the symbols mean since I assume looking them up will be simple. I'm curious about it's rarity and worth outside the price of gold. Definitely not looking to sell it, but I'd love to know what it's worth at least. The ring in the photo is a Scottish Rite ring, Michael. The Scottish Rite is one of many appendant bodies within Freemasonry. For more detailed information about some of the symbols on your Ancient and Accepted Scottish Rite Freemasonry ring, here is the page I have already written about another piece of Scottish Rite jewelry. As to its monetary value, I cannot say, as I am not a Masonic jewelry collector nor a jeweler. Jewelry is a subjective entity. What one person passionately believes to be beautiful, another may find to be only mediocre. So, it's value is actually in the eye of the beholder. There are Masonic jewelry collectors, most of whom you will find, use E-Bay to both buy and sell Freemason jewelry. Hope this is helpful, Michael. I'm sure your great grandfather's Scottish Rite ring was worn by him with great pride. Thank you for sharing it with everyone. The ring contains the symbols of the four bodies within the Ancient and Accepted Scottish Rite as well as the symbol for the Shrine. 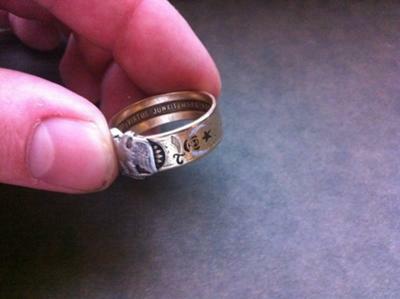 The inscription inside of the ring is "Virtus Junxit Mors Non Seperabit" or "What virtue conjoins, death does not separate." The triangle on the back side of the ring is actually symbolic of the 14th degree; this symbol and the contained inscription are described in Masonic ritual and a ring bearing these symbols is the only official ring described in Masonic ritual. It is worth about $350, but the sentimental value should be much higher to you. If you do sell it, make sure you sell it to a Brother Mason of the 32nd Degree. This ring does not appear to contain any symbols beyond that of the 32nd degree (double headed eagle). I have one very similar to this from one of my ancestors and it is my most prized possession. First of all that is a very nice ring and it's from around the 50s. The 2nd thing is that it has the Shriner's symbol on it so you might want to check into that and I didn't get to see the other side of the ring. It might have the York rite symbol. 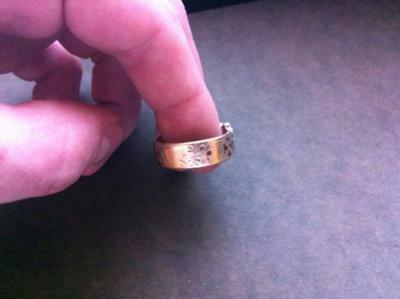 The Scottish Rite Ring price is between $250 and $400, but I hope the ring is worth more to you. I'm sorry to hear one of my bros has passed on. I hope this is of some help. Hello Michael. I think that the ring could be for the 18th-33rd degrees of Rose Croix lodges.